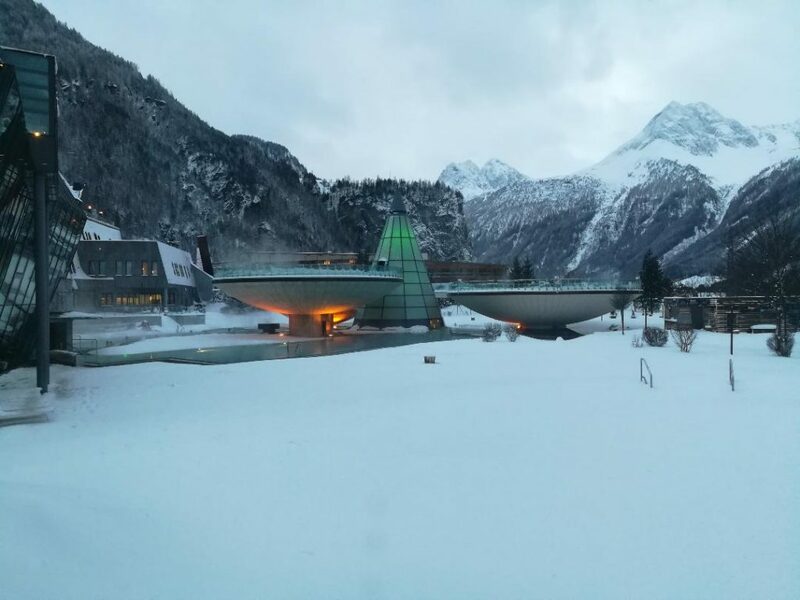 The Aqua Dome in Tyrol is not only a thermal spa with indoor and outdoor pools. It’s a global concept to make the guest relax and enjoy his stay. While staying in the hotel next door one can use the spa free of charge. All other guests will pay a daily entrance fee to enjoy the mountain view, the hot water and the different amenities like sauna area and kids zone. Families with young children have certain requirements. 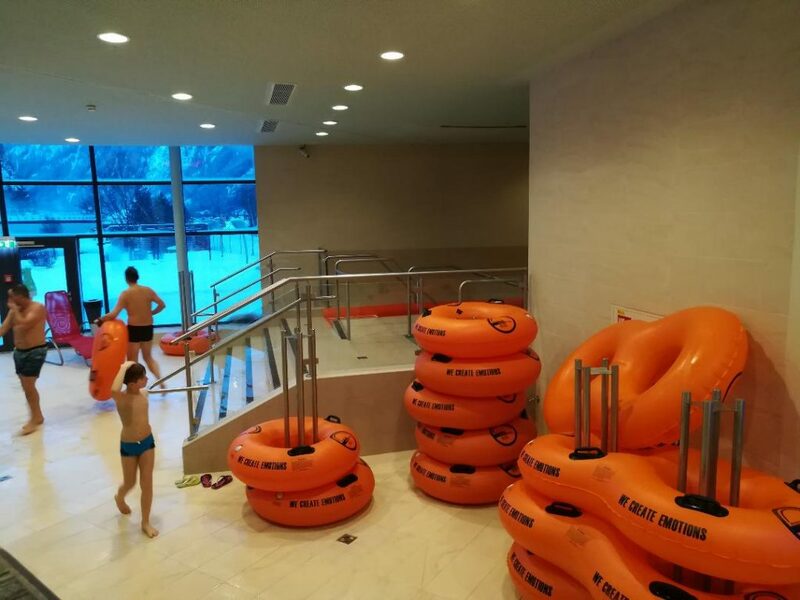 Very often it’s difficult to go swimming because the water is too cold, the pool is not safe enough or there aren’t enough lounger to relax. 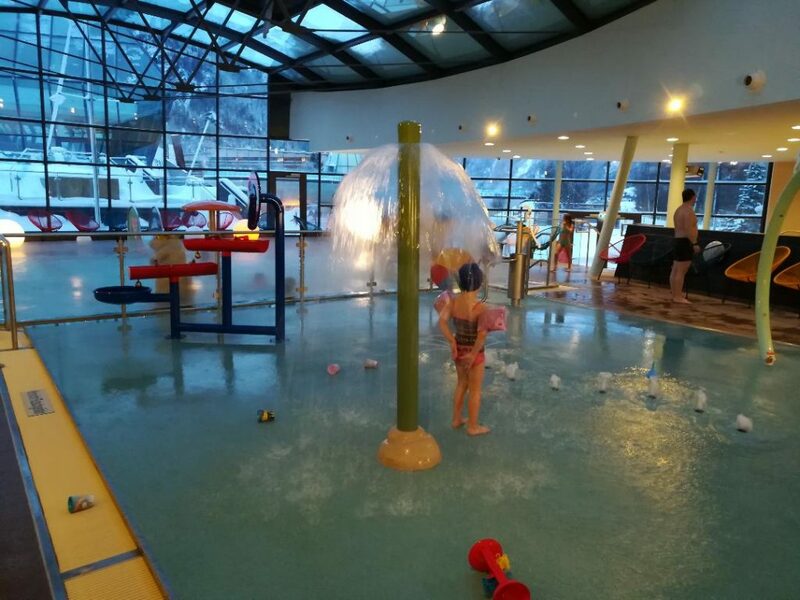 Entering the Aqua Dome in Tyrol is like becoming part of a thermal spa designed by parents. After paying for the family ticket (86€ for 2 adults and 2 kids/per day, children below 3 are free of charge) you get your own changing room. There you can change yourself and leave your clothes until the end of your stay. If your toddler is still having a nap at noon simply take your stroller with you into the Aqua Dome. 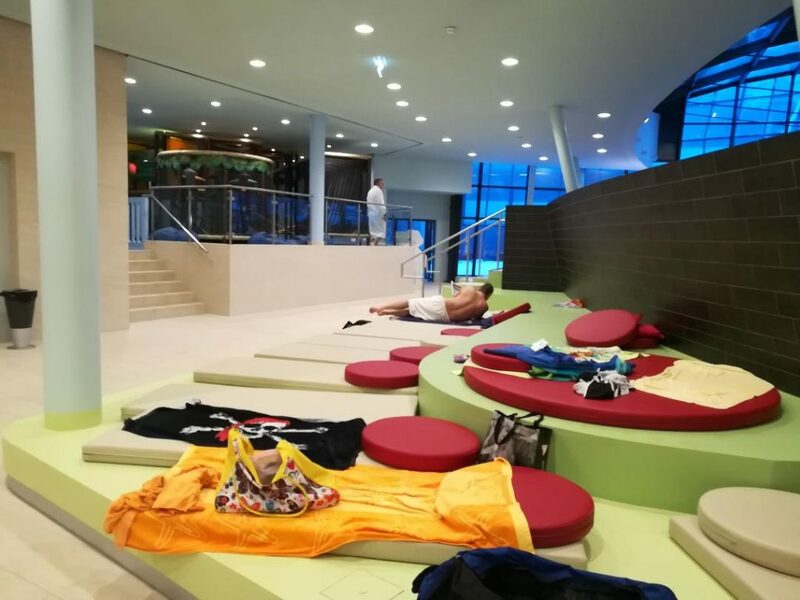 The kids area is separated from the main thermal spa. It consists of an indoor playground with art area supervised by a nanny. She’ll take care of your 3+ year olds. If your children are younger you can use this area as well, but only under adult supervision. 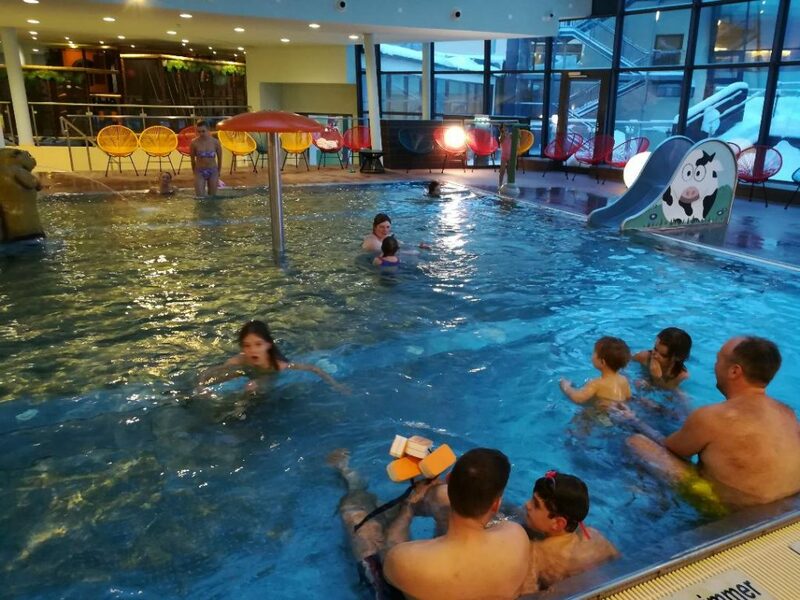 The waterplayground is right opposite the indoor playground. Easy to keep all children in sight. We found the waterplayground perfect for 0-3 year olds. Simply have some toys (cups, watering cans, …) with you and let them play in a safe environment. Right next to it is the childrens pool. It’s too deep to use without armbands (0-3 year olds). Sliding and playing with the water is so much fun, as it’s warm. A big advantage: the floor is exceptionally not slippery. For older ones one tube slide and a normal one are hidden behind the kids pool. You’ll find also adults there. Adrenaline rush at its finest. After enjoying the water everyone gets hungry. The restaurant offers a kids buffet with drinks for only 6€. Spaghetti Blognese, chicken nuggets and french fries are only some examples. Parents might go for the huge variety of salad, austrian dishes or steaks. Taking a nap on one of the loungers or simply let your children play. Allover it has to be said that the Aqua Dome in Tyrol is amazing for families. Stop there, have a great day and leave relaxed. There are several sayings about people, who love the seaside and others who love mountains. It’s a bit like being a dog or a cats person. One can’t have both. 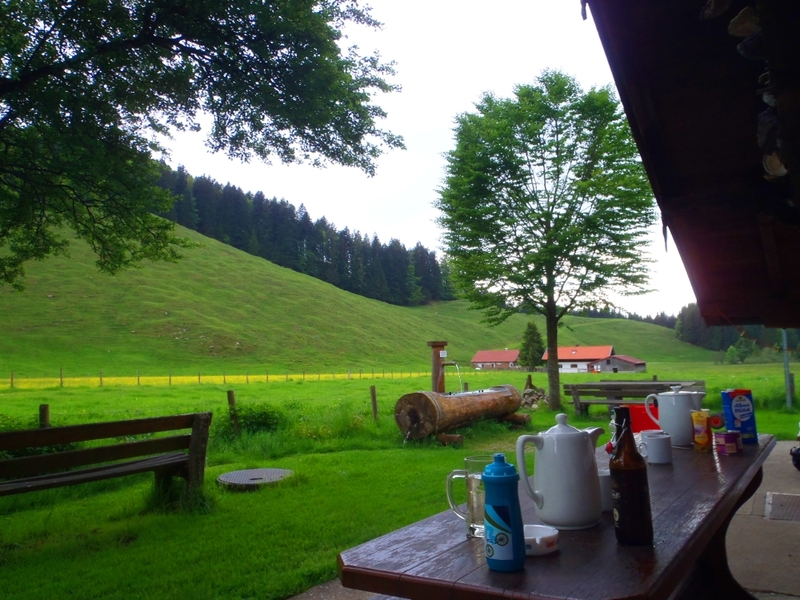 My family has the tradition of spending one hiking weekend per year in the foothills of the Alps in Austria. Already till 20 years. However, we’re all more the seaside lovers. So this hiking holiday in Austria is the alibi weekend to pretend being both. Not to freeze and shiver we try to get the cabin between May and July.